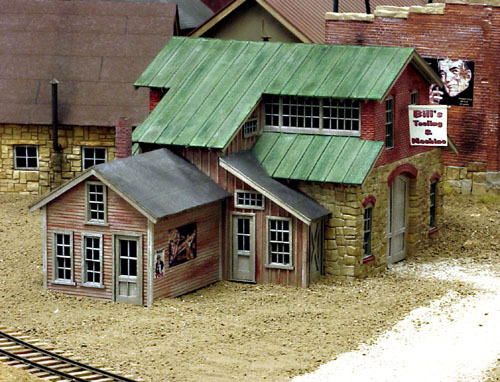 This photo article features a Banta ModelWorks, "B & M Machine Shop" kit. 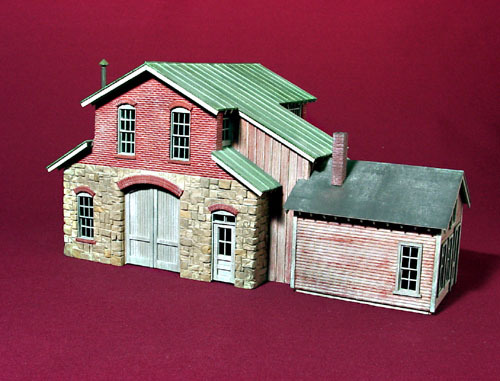 It is the "S" scale version of an "O" scale kit that was designed by Roger Malinowski and released during the 2001 Narrow Gauge Convention in Salt Lake City. 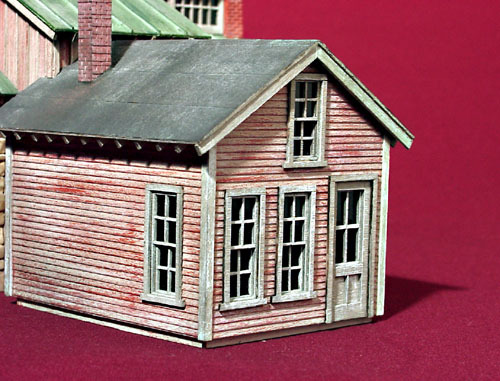 The completed model is currently located in the community of Tall Timber, CO on my Cimarron & Tall Timbers RR. 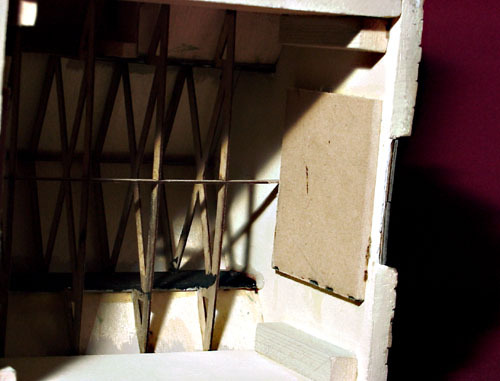 The kit consists of four highly detailed plaster walls, laser cut plywood and bass wood exterior siding. Prior to gluing the plaster panels together, I made sure the windows and doors would fit into their respective openings in the walls. An X-acto knife was used to adjust the openings, but I was careful not to cut thru the thin plaster, "skin," that was covering the interior surface of all the window and door openings. The interior would not be illuminated, so the the thin plaster, "skin," was left intact. The vertical seams at the joints of the plaster walls were filled with fresh plaster. New stone shapes were carved in the dampened plaster with a dental pic creating an interlocking stone appearance. The plaster part of the structure was then painted with Krylon satin finish, "Almond Satin," spray paint to seal the plaster and give it an overall limestone color. 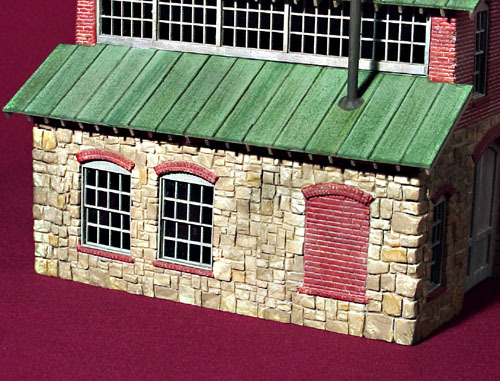 Folk Art paints were used to paint the individual stone and brick carved details. 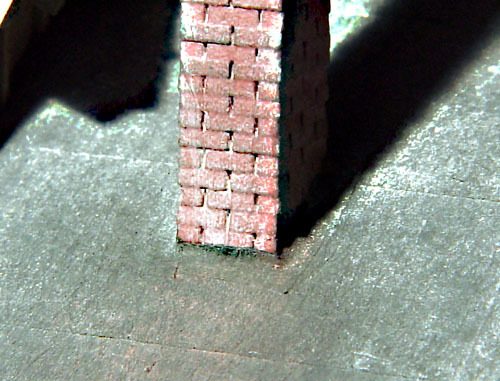 When dry, thin washes of additional Folk Art paints were added to color the mortar lines. The laser cut trusses for the main building were glued together with Dr. Mike's AC adhesive. The clerestory windows were assembled and thin, clear lucite pieces were used for glazing instead of the included laser cut acetate. I wanted this window component to be stiff and the lucite provided the strength. The interior surfaces of all the window and door glazing pieces were painted with black paint. I used Floquil, "Engine Black," paint first because it would etch the acetate and bond better to the lucite than the acrylic craft paints. Any spots that remained clear were touched up with Folk Art acrylic black paint. The entire truss/window assembly was attached to the building with 5-minute epoxy. 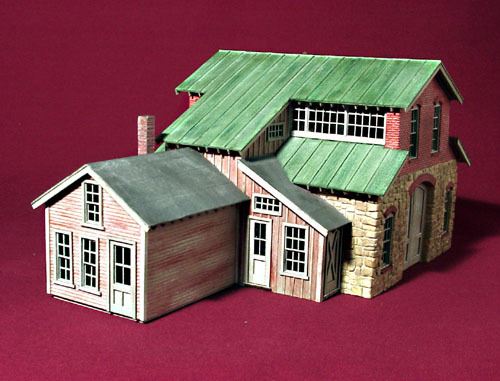 The building addition and office units were added next. These parts are laser cut and fit together nicely. Bass wood lap siding panels are provided for the office unit. The building addition is laser cut plywood with etched guide lines for the batten boards which had to be individually cut from the enclosed 1" x 2" strip wood. 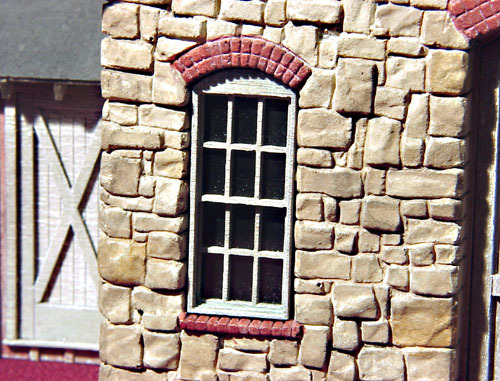 The painting and weathering on the wooden wall components was completed before the windows and doors with their blackened glazing were attached. The office roof was installed first while it was easy to reach. I used silk span paper, trimmed to a scale 3' width, for the roofing paper and secured it in place with Polly Scale, "Tarnished Black," paint. This photo shows one of the window units installed in one of the plaster wall components of the building. 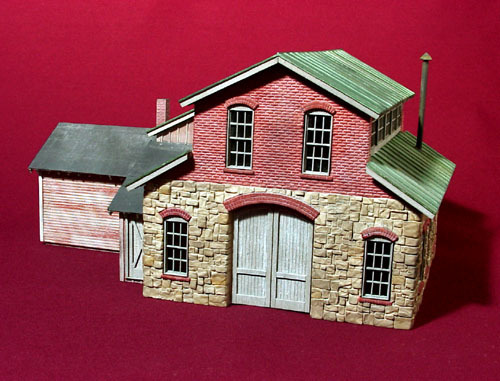 Chimneys and smoke stacks are not included in the kit, but I had some in my detail box. After painting the metal chimney casting with acrylic paint, it was secured in place with 5-Minute Epoxy. 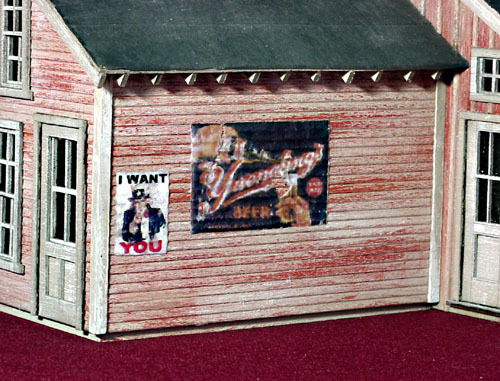 Tiny pieces of the Silk Span paper were cut and secured with paint to suggest flashing around the roof line of the chimney. The smoke stack casting originally had a 90 degree bend in it and normally would have extended out a wall. I trimmed the horizontal part off and used what was left to make a vertical stack. It was painted Tarnished Black and weathered with my rusty vinegar and dissolved steel wool solution. 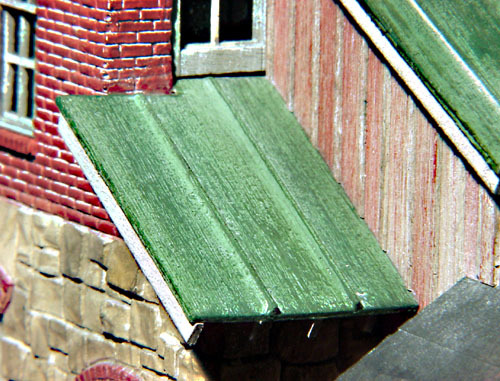 The raised seam roofing is another neat part of the kit. Laser cut lines are burned into the thin plywood roofing panels and wooden strips are glued in the grooves. Sanding sealer was then brush painted on to eliminate the wood grain, creating a smooth, metal-like appearance. All the raised seam panels were given a base coat of Folk Art green paint before being attached. Once secured, I created the weathered copper color by dry brushing two additional shades of green paint on the base green coat. When the paints were dry, everything received a final wash of black shoe dye and alcohol. A small round piece of paper was cut to serve as flashing for the metal smoke stack. After the stack was secured with Epoxy, it was weathered further with the rust solution. 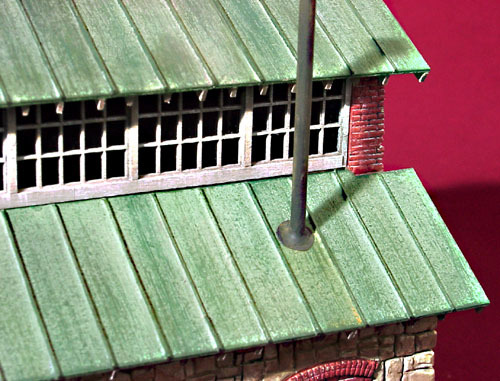 Some of the rust was also brushed on the roofing to suggest additional weathering. Fly rafters were cut from scale 2" x 6" strip wood. A NWSL, "Chopper," was used to cut the rafter ends which were glued to the pre-marked underside surface of all the roof panels. The interior bracing for the roof can be seen in this photo, along with the scrap piece of Masonite that was used to reinforce the, "plaster skin," that was left in the doorway of the wall. 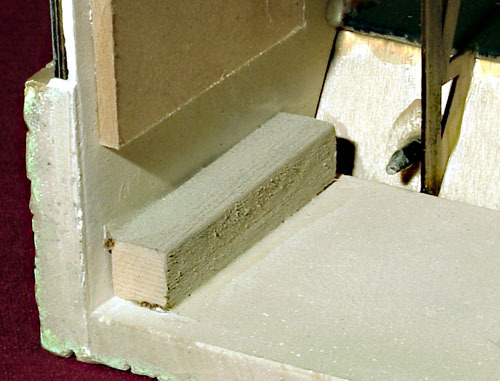 Rather than relying only on the glue to hold the plaster wall pieces together, 3/8" square pieces of strip wood were use to reinforce the joint. The hanging sign was created with Photoshop LE and printed on glossy white paper. Before it was cut from the sheet, the printing was sprayed with Krylon Matte Spray to prevent the colored ink from smearing and running. The pole is a piece of brass rod that had a tiny dot of solder added to the end. Before the paper was attached, the pole was painted with Polly Scale, "Aluminum paint." To prevent it from being damaged, it is loose in the hole so it can be withdrawn easily when the building is removed from the layout. A couple of the posters that were included in the kit were glued to the side of the office. After trimming them from the sheet, they were turned face down and their paper backing was dampened with water. An X-acto knife blade was carefully scrapped over the wet backing until most of it was removed, leaving only the printed material. This thin, almost transparent, piece of paper was then attached with diluted white Elmer's glue. 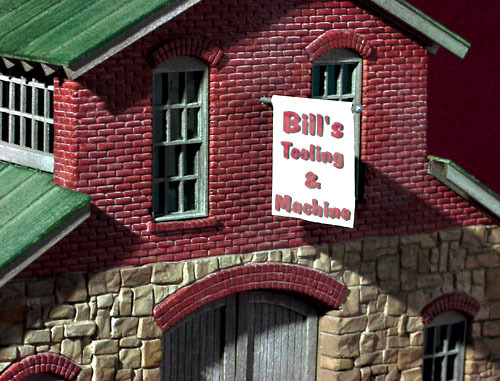 Bill's Tooling & Machine now occupies a prominent spot in the community of Tall Timbers, CO on the layout and is open for business.